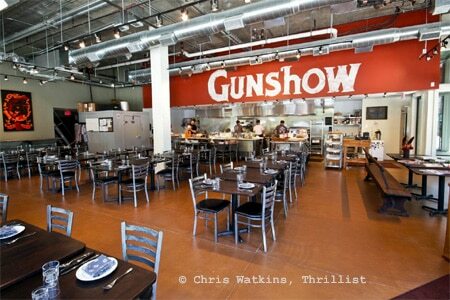 Breaking the rules for "fine" dining, Kevin Gillespie's Gunshow takes the experience in another direction. : With executive chef Joey Ward in day-to-day command of the kitchen, busy chef Kevin Gillespie's Gunshow challenges every notion of the traditional dining experience, with a format-free menu that changes weekly. The restaurant's design brings patrons into intimate contact with the preparation process, which may be readily viewed from the communal tables. Staffers present dishes dim sum style, and guests choose which ones they want to try. Gillespie's inspiration is as likely to reflect the upper crust of Southern fare as it is the region's country-style food. Not only cornbread, but also rarely seen spoon bread may be on the menu. Crispy fried quail, suggesting the cooking of Southwest Georgia's gracious plantations, may share space with a peach fried pie. Georgia suppliers' products grace the dishes, as chicken may come from southwest Georgia's White Oak Pastures or the coast's Grass Roots. Reinvented classics may be in the form of a rosy beef Wellington, sliced thinly. Pastry chef Billy Cole has his eye drawn on turning out intriguing desserts, which could include a warm version of old-fashioned banana pudding or chocolate cake with egg yolk gel, coconut and pecans. The wine list is challenging, and there's a cocktail cart that provides tableside drink service.